Question 1 What are luminous objects.Give example? Question 2 What are non-luminous objects.Give example? Question 3 State the laws of reflection? Question 4 What is beam of light? Question 5 Define the term reflection of light? Question 6 What is a real image? Question 7 What is a virtual image? Question 8 Write the properties of images formed by plane mirror? Those objects which emit their own light are called as luminous objects. Those objects which do not emit their own light are called as non-luminous objects. When light emitted by a source falls on an object,some of the incident light is returned back by the object.The light returned back by object enters our eyes.Hence the object is seen by us. If an object neither emit light nor reflects the light falling on it,then that object is not visible to us. Light travel in a straight line which is represented by Ray of light. A group of parallel rays of light emitted by source of light is called beam of light. The phenomenon of bending of light when it goes from one medium to another medium is called refraction. The phenomenon of bending of light around the corners of an opaque object is called diffraction. The phenomenon of returning of light in the same medium after striking a surface is called Reflection of light. 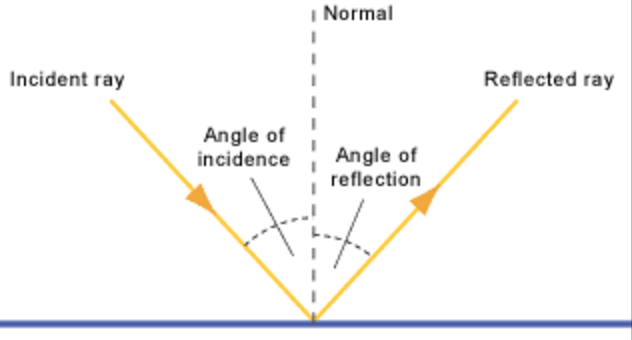 1)Angle of incidence is equal to angle of reflection. 2)Incident ray,reflected ray and normal to the reflecting surface at the point of incidence lie in the same plane. 1)Image is virtual and erect. 2)Size of image formed is equal to size of object. 3)The distance of image behind the plane mirror is equal to the distance of object from the mirror. 4)Image formed is laterally inverted. Real Image:When ray of light after reflection meet at a point.It can be obtained on screen,always inverted,formed in front of mirror. Virtual Image:When ray of light after reflection,do not meet at a point but appears to meet at a point.It cannot be obtained on screen,formed behind the mirror,erect. Nice content for school going childrens. Hi .i checked d website n found useful as well as meaningful. Good explanation with well labelled diagrams. Examples n reason based r explained in easy n understandable language.I vl Tel my students also to go through. I hv gone through d contents n found dm v interestingly dealing with d concepts in an easy way. Keep up d good work. I found it good package fr learning. I hv seen nervous tissues n reverberation as well. Our revision notes make last minute studying a breeze. Designed in a format which is easy to grasp and remember, these revision notes give students that extra edge to attempt their exams with confidence. Find answers to all the questions in your textbook with these solutions. Detailed out step-by-step by teachers and experts, these model solutions are a priceless aid for students while learning, preparing for the exams and for assistance while studying.